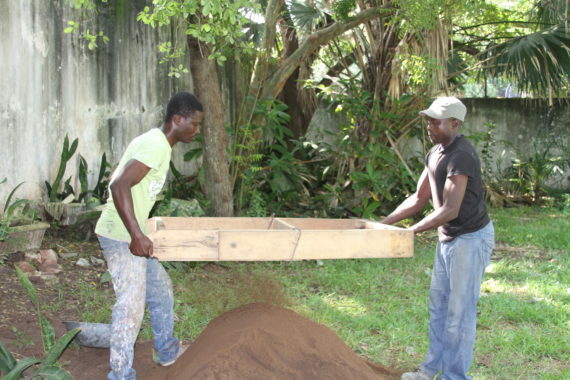 A local community group including direct descendants of former slave traders are excavating the seventeenth century Danish trading post, Christiansborg at Osu in Ghana’s capital Accra, to learn more about their history. 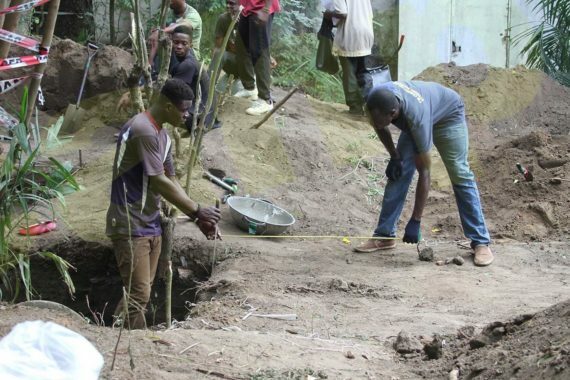 Ghana’s first female archaeologist Prof. Rachel Ama Asaa Engmann, is leading the community archaeology project at Christiansborg or “Osu Castle” as is known by the local people. “This is the first archaeological excavation of the site”, says Engmann, the first researcher granted access to the castle. She trained at Columbia and Stanford Universities and is currently a Professor in Archaeology at Hampshire College – all in the United States. 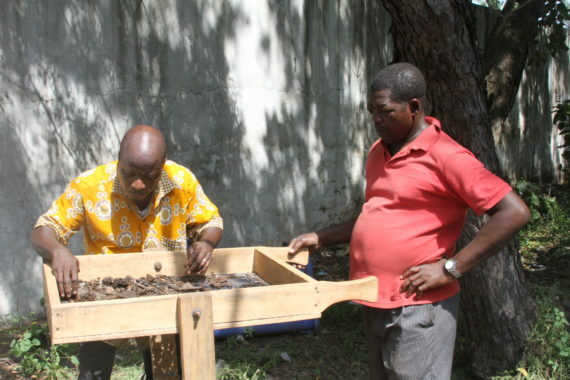 “The team is composed of members from the local community, including direct descendants. Lecturers and graduate students from the University of Ghana trained the team. The number of team members has grown over the years. Currently, there are thirty participants, which includes men and women ranging in ages from sixteen to late sixties. Team members are recruited by word of mouth”, she says. 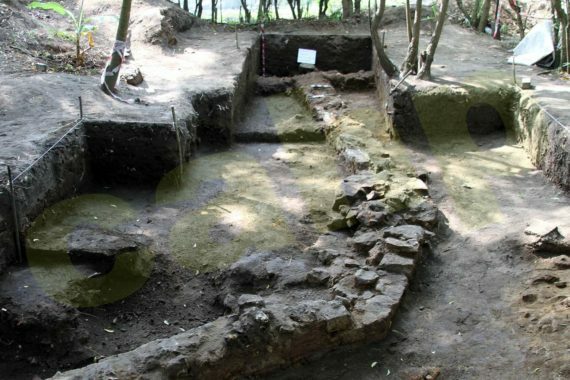 “To date, we have excavated an extensive pre-colonial settlement. This includes the foundations of houses and what we tentatively think is a kitchen since it contains three stones (for balancing a cooking pot) and charcoal, in keeping with local cooking area design. We have also retrieved a large collection of local and foreign manufactured objects obtained through the transatlantic trade. 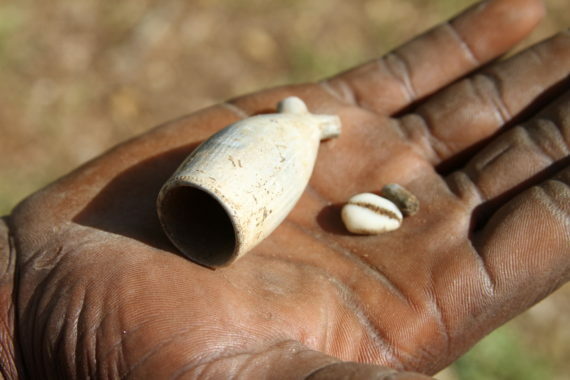 We have identified what are commonly known as ‘African trade beads’ that were produced in other parts of Africa, as well as Europe, including Italy and Holland. Ceramics include Chinese and European ceramics, as well as local pottery. 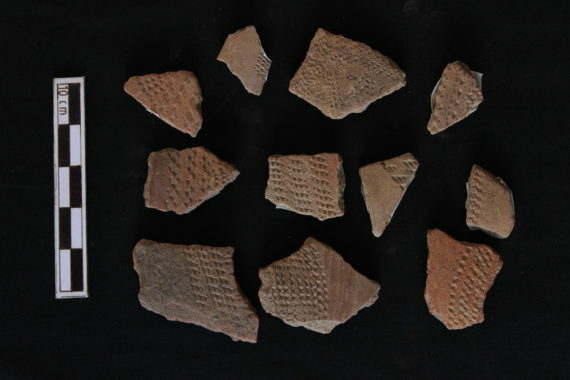 An African smoking pipe and numerous Dutch, English, German, and Danish clay smoking pipes were recovered from the site. European glassware ranges from every day usage to refined, luxury ware”. 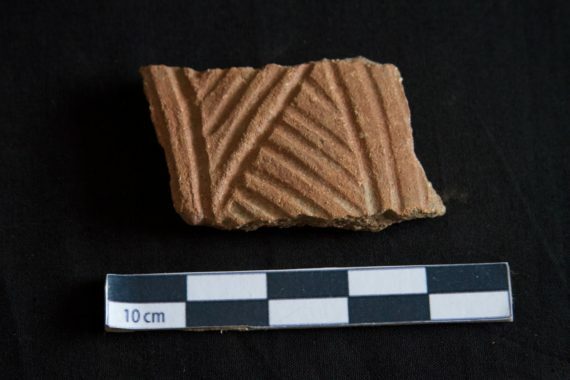 “There are a number of other small finds including a slate fragment, typically used for writing, as well as faunal remains, seeds, metals, stone, daub, cowrie, and other shells. 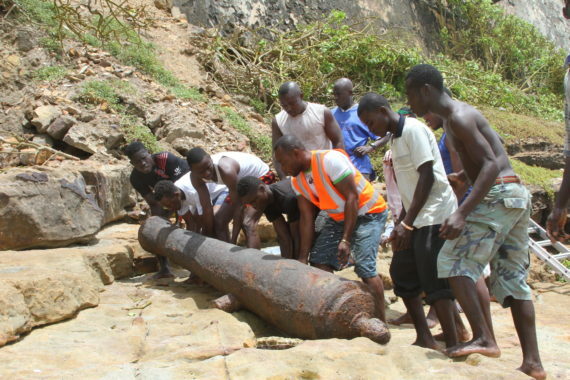 With the assistance of local fishermen, we even excavated a canon immersed in sand that had fallen from the castle above down on to the beach below. Under the castle, we also discovered the entrance to an underground tunnel that led to the nearby Richter House, formerly owned by two successful ‘mulatto’ Danish-Ga brothers who were important slave traders. This tunnel meant captive Africans could be transported from the house directly onto slave ships at sea”. Christiansborg Castle is a UNESCO World Heritage Site, former seventeenth century trading post, Danish and British seat of colonial government administration and until recently, office of the President of the Republic of Ghana. Today, it is known in local parlance simply as ‘Osu Castle’ or ‘The Castle’. Queen Margrethe of Denmark visited Christiansborg in 2017 when she went on an official trip to Ghana. The Swedes built Christiansborg Castle in 1652 as a trading post. In 1661, Denmark purchased the site from the Osu Paramount Chief for 100oz of gold in order to conduct trade. The Danes constructed Fort Christiansborg (‘Christian’s Fortress’), named after the King of Denmark, Christian IV. Over time, the Danes enlarged and converted the fort into a castle. Denmark occupied the castle until 1849, with the exception of a few brief periods: between 1679 and 1683, it was sold to and occupied by the Portuguese, and renamed Fort Sao Francis Xavier; between 1685 and 1689, it was mortgaged to the British; and in 1693, Asameni, a trader and chief of Akwamu, in Ghana’s Eastern Region, gained possession of the castle through subterfuge and acted a ‘governor’, but sold it back to the Danes in 1694. Christiansborg Castle contained a courtyard, chapel, ‘mulatto school’, warehouse storerooms, residential quarters, dungeons, bell tower, cannons and saluting guns. The castle walls depicted the ciphers of Christian VI and Christian VII. In the castle courtyard, a cistern was inscribed with Governor Carl Gustav Engmann’s name. Enslaved Africans were sent from the castle to the Danish Virgin Islands, namely St. Johns, St. Croix and St, Thomas (today the US Virgin Islands). In 1685, Christiansborg Castle became the Danish administrative headquarters in West Africa, and along with nine other forts and lodges, enabled Denmark to acquire a near monopoly of trade on the coast. Christiansborg Castle was so vital to the Danish economy that between 1688 and 1747 Danish coinage depicted an image of the castle and the inscription, ‘Christiansborg’. Danish men married Ga women creating the emergence of a Danish-Ga community, in an area that became known as ‘Danish-Osu’. Today, the Lutterodt, Quist, Wulff, Hansen, Richter, Aarestrup, Jacobsen, Lokko, Malm, Palm, Pedersen, Quist, Sonne, Svanekjær, Truelsen and Engmann families still carry the names of their seventeenth, eighteenth and nineteenth century predecessors. Many Danish-Ga direct descendants continue to live close to Christiansborg Castle.